Brydon, Swearengen & England P.C. shareholders and attorneys Paul Boudreau, Russ Mitten, Dean Cooper, and Erin Wiseman attended the Friends of the Missouri Governor’s Mansion Holiday Gala on December 9, 2015. 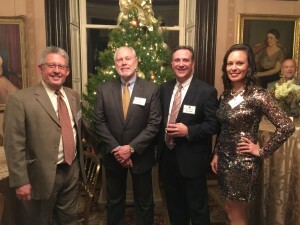 The Friends of the Missouri Governor’s Mansion is a nonprofit supporting organization, which works in partnership with the State of Missouri to preserve the Missouri Governor’s Mansion, its history and historical treasures. The group had a great time and looks forward to attending the charitable holiday event again in the future. Below you can find a picture of the shareholders in front of a Christmas tree at the Missouri Governor’s Mansion.